Author Harvey Araton saved the best for last. 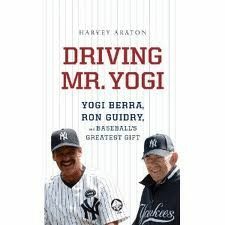 Driving Mr. Yogi: Yogi Berra, Ron Guidry, and Baseball’s Greatest Gift is a title worth remembering. Yankee fans who judge a book by its cover will be sold immediately. Red Sox fans and anyone else ambivalent about the Bronx Bombers will be glad to know that the “gift” is friendship. The story revolves around how spring training reunited the pair in 1999. Berra befriended Guidry years earlier as a pitcher. So much of Driving is off the field. Guidry looks after the senior citizen, driving him to and from the Florida ballpark or sharing evening dinners. Unlike other authors, Araton paints a complete picture of Berra. This is about far more than quirky sayings. This book describes the pride that powered a 14-year standoff with team owner George Steinbrenner. Araton eavesdrops on conversations between the unlikely duo. Guidry is fiercely loyal. Berra isn’t the comical chatterbox past press accounts have claimed. Together, they reveal that the same uniform was just the beginning of all they have in common. One of the author’s greatest accomplishments is allowing us to see Berra through Guidry’s eyes, and vice versa. Former team public relations director Rick Cerrone tells of asking Berra to autograph the 1984 Sports Illustrated cover. “What should I write?” Berra had asked. “How about ‘It ain’t over ’til it’s over’? Cerrone had said. Coach Stump Merrill told of picking up Yogi from their spring training hotel. Merrill would rescue Berra from mobs of autograph seekers. From page 203, Berra sounds more like a collector than signer. “With a fresh stack of magazines in front of him, Berra resumed signing, firmly and meticulously, nothing like the standard celebrity scribble. He took his cue on that from the men he considered the masters of legibility. Ted Williams and Joe DiMaggio. I’ve seen one reviewer speculate that George Clooney could play Guidry and Ed Asner Berra in the movie version of the book. I’d second that notion. Driving Mr. Yogi is a fascinating, insightful tale of friendship reaching across generations. Don’t miss this title. Coming Friday: How do former players feel about their baseball cards? Here’s the blogger who knows!